The best way to get your money’s worth out of seeing a new movie at the cinema is to wait until it comes out on DVD and watch it at home. Of course some may say that watching a new release on a big screen is far superior than watching it on a small screen, but I dub those people as movie snobs and don’t associate with them. And by golly, if they dare say my 13-inch, 25-year-old TV is not good enough for Hollywood, then they’re saying I’m not good enough either, which may be the truth, but who’s counting? I used to go to the cinema to watch movies, but that was during the heyday of neighborhood single-movie theater houses. I still remember the box office, the red carpet, the chandelier, the golden rope guarded by a bowtie-wearing usher who actually took your ticket; I remember the plush seats, the dimming of the lights, the raising of the curtain, and then cuddling up on the back row with my sweetheart until that usher guy came and shined a light in our faces, spoiling the whole mood. Harold was his name. It was printed on his nametag. He had onion breath. I still have bad dreams about the whole incident and would rather not talk about it. In fact, I’ve said too much already. I went to a movie the other day, against my better judgment, and the kid sitting next to me kept stepping on my toes every time he got up to go pee. Why he didn’t take care of his business before the movie started only his parents know because I wasn’t curious enough to ask. And then I noticed that a lot of people were getting up to go pee during the movie, either that or getting more popcorn. People coming, people going, people stumbling up and down the stairs, people saying, “Excuse me,” and “I’m sorry,” and “I promise this is the last time,” children giggling, fathers cursing, babies having their noses blown, others talking, slurping their drinks, getting up to go pee again. In the old days, the atmosphere of the theater was one of the things that made going to a movie so great. Today’s cinemas have the atmosphere of a crowded New York subway station in July, where the person beside you just picked your pocket and smells like he pooped his pants. A movie on my own small screen is so much more relaxing (and aromatically pleasing). First off, I know who sat in the chair before me. Me. If I need more to eat or drink, the icebox is just a short walk away. If I need to pee, I can pause the movie and restart it on my return. And if I like the movie, I can watch it again without paying for another ticket. Yes, I do miss cuddling up on the back row with some curvaceous brunette, but it’s not worth it these days – especially since my wife has a shotgun and excellent aim. 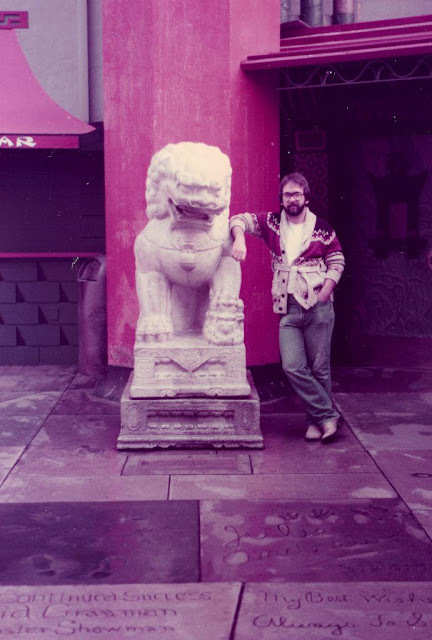 This is me standing outside of Grauman's Chinese Theater in Hollywood. As you can tell, this photo was taken back in my much younger movie-going heyday! Today I much prefer Netflix.